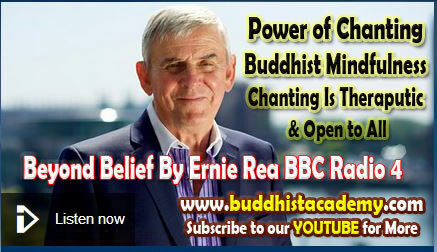 This is an excellent programme done by BBC Radio 4 By Ernie Rea on his programme "Beyond Belief" titled as Power of Chanting. Here Dr Sarah Shaw is doing an exceptional and well balanced representation to the meaning, breadth and depth of the Buddhist Chanting without diluting the authenticity. In enormous gratitude to them all and BBC R4, we publish this to share with our community. Therapeutic and Open to All. This is an excellent programme done by BBC Radio 4 By Ernie Rea on his programme "Beyond Belief" titled as Power of Chanting. Here Dr Sarah Shaw is doing an exceptional and well balanced representation to the meaning, breadth and depth of the Buddhist Chanting without diluting the authenticity. Dr Sarah Shaw even chants the most important part of Meta Sutta (discourse on loving kindness) beautifully. Professor Michael Trimble was for many years a Professor of Behavioural Neurology and consultant physician to the Department of Psychological Medicine at the National Hospital. In enormous gratitude to them all and BBC R4, we publish this to share with our community. Chanting has been practised for thousands of years by Hindus, Buddhists and Christians. It is said to have health benefits and today, practitioners suggest that it can combat the stresses of modern life. Joining Ernie Rea to discuss the power of chanting are Dr Sarah Shaw, Honorary Fellow of the Oxford Centre for Buddhist Studies; Christopher Page, Professor of Medieval Music and Literature at the University of Cambridge and Gresham Professor of Music at Gresham College, London; and Michael Trimble Professor Emeritus and Consultant Physician to the Department of Psychological Medicine at the National Hospital London. Pop singer Belinda Carlisle talks about how chanting has helped her to combat her addictions.